and I've essentially gotten there, or close enough. 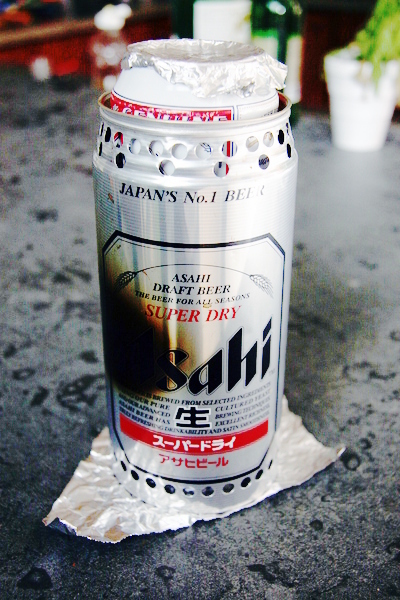 The windscreen/heat reflector/pot support is a 1L Asahi Super Dry can. The bottom inch or so is snipped off. The top is removed using a safe cut can opener. Ventilation holes were made at the top and bottom using a hole punch. The contents were consumed and were delicious. 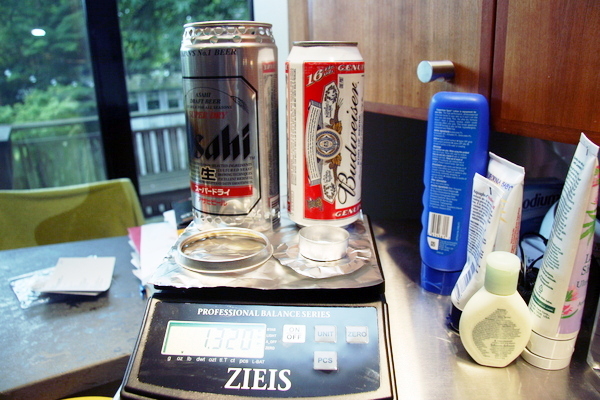 The pot is a Budweiser tallboy, which takes 16oz with about 1/4" of room to spare. The top has been removed using a safe cut can opener. The ring around it is explained below. The contents were consumed and better than Heinekin, at least. The pot lid is a scrap of household aluminum foil. The stove is a tealight candle cup. The candle was not eaten. A larger scrap of aluminum foil goes underneath to act as a heat reflector and insulator from below. 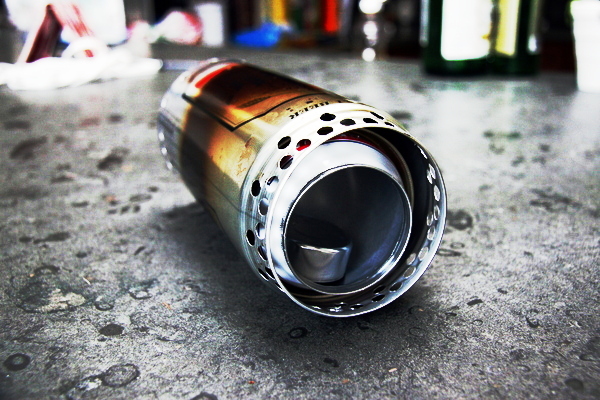 The only tricky part to make was the ring around the tallboy which allows the Asahi can to hold it above the stove. 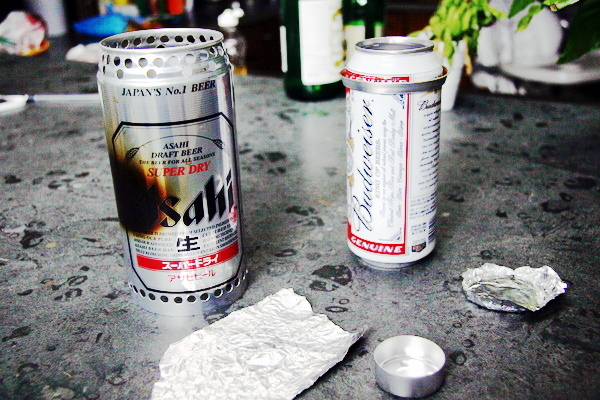 That's the outer part of the Asahi can top - basically with the whole flat middle part removed. To cut that out (lacking a lathe), I drilled a hole in the middle, mounted it on a bolt, put the bolt in my drill, and spun it while cutting with a utility knife. The ring was just the right size to compression fit over the tallboy without easily moving. (Otherwise I'd have used a spot of JB Weld.) Since it's from the Asahi can, it slips right into the windscreen and holds the pot pretty straight and centered within it. Originally I punched more bottom holes in one side of the windscreen for better wind protection, and since the stove isn't pressurized, it burned off-center (causing some of the scorching you can see - but most was due to a different stove I tried in it). So I punched more holes evenly around it and will use the bottom piece of foil curled up on the windward side to help protect against wind. It the quietude of my kitchen I got 2 cups from 22°C to boil in 9 minutesw with 1/2oz of ethyl alcohol in the tealight cup. Burn time was perhaps another minute. Cut off the rest of the thick rim off the pot and windscreen, at the cost of some strength. Shorten the windscreen some, at the possible cost of fuel efficiency, and/or punch out more holes, which would possibly need to be blocked with foil. Glue a few bits of aluminum to the pot as a support, rather than the ring cut from the can top, at the cost of some elegance. Obviously a protective case will blow the weight budget, so it's more practical if there's some naturally protective place for it to be stowed. Of course it isn't that fragile and any crushing could probably be fixed in the field. Another issue is the lack of a pot holder. You'd need to use gloves or a bandana or something to pick it up when hot. You can pick up the whole windscreen-pot assembly at once and pour out the water - that works fine. If there was a need to remove the pot from the windscreen, a strip of aluminum epoxied to the pot as a bail would probably be worth adding. Also, the ultralight lid will be tempted to blow away in any kind of wind. The stove hasn't been tested in windy conditions.